Check out Crazy Horse Appearing. This page features Chapter 7 of the FREE full text version of this new life story of the great Lakota Chief. The book's other chapters are linked below. This book is available in both full text and audio formats. Certain unscrupulous individuals and companies are trying to sell copies of Crazy Horse Appearing online. They do not have any contract with, or permission from me, the author and copyright holder of this work. There is no need to buy it online, or anywhere else. You can read (or listen to) free books online right here. Crazy Horse Appearing is a contemporary award-winning novel, offered as a FREE gift from the sacred spirit of Crazy Horse. 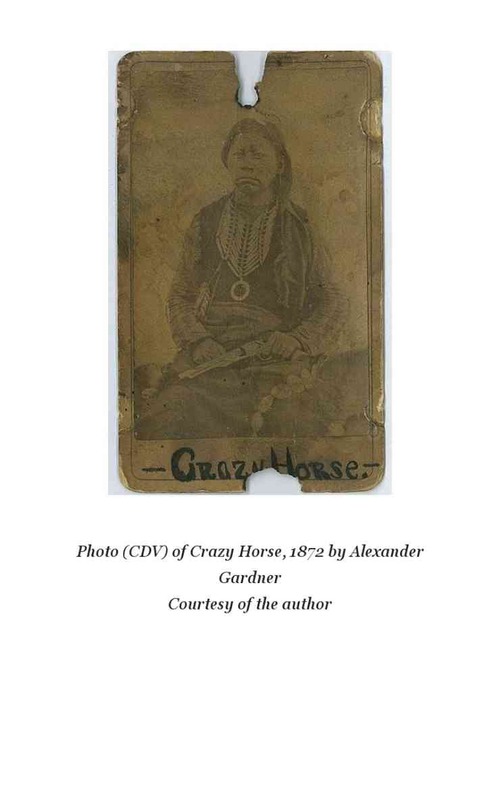 Please enjoy this new life story of Crazy Horse, with freshly dug facts never before uncovered, along with the ONLY fully authenticated picture of Crazy Horse known to exist. Crazy Horse is my hero. I trust he will be your hero too. Be sure to also visit the related links at the bottom of this page. In the fall of 1870, Crazy Horse and Hump joined a team of raiders in a battle against a band of Shoshones who were occupying Oglala hunting grounds near Wind River. The day was cold and wet. A dreary gray rain was turning swiftly into snow. Crazy Horse was apparently plagued by premonition. Hump could just not believe his own ears. Slowly, he turned and gaped at Crazy Horse with his mouth slightly open, momentarily at a complete loss for words. Did he just say “too slushy?? ?” For a Lakota, even the most extreme weather conditions were welcomed as a challenge and endured without complaint. Not even women made mention of it. Not even children! “Their horses find it slushy too,” said Hump. “I am sure we are outnumbered,” insisted Crazy Horse, “maybe twelve to one." “Do you so easily forget?” asked Hump. “We called off a fight here once before. They laughed at us! Called us women! Told us to go share a tipi and read futures and dream up secret names for children! I shall not endure THAT again! I would sooner pierce my flesh at the dance. Turn back if you must. I will stay and fight." Crazy Horse and cousin Hump were sworn friends since childhood. They had made a solemn pact to share everything in life – to go through each and every experience together as a team, like brothers. So Crazy Horse stayed, and they fought. At some point, Crazy Horse, Good Weasel, and Hump charged a group of Shoshones from three directions. When they returned, only Crazy Horse and Good Weasel were left. Hump had fallen from his injured horse, and was ambushed by the Shoshones. Crazy Horse and good Weasel could not reach Hump, and barely escaped with their scalps attached. Four mournful days later, after breaking the unbearable news to his Brule uncles, Crazy Horse and his friend Red Feather revisited the scene to recover Hump's body. All that was left of his closest cousin and lifelong friend was a skull and a few scattered bones. Even these the coyotes had licked as clean as a porcelain plate. Despite that Hump was only 31 years old, Crazy Horse is not known to have ever tried to avenge the death of his cousin. However, losing Hump drove Crazy Horse temporarily insane. There are many ways a man can react to the loss of his mind. Crazy Horse, as always, took the high road. Purposefully, Crazy Horse rode over to Red Cloud's camp, ignoring the called out greetings of his friends, bypassing the Bad Face's without a glance, bypassing his own lodge (where still he lived with his parents), finally arriving at No-Water’s lodge. No-Water was away from camp at the time. Crazy Horse entered the tipi unannounced, much to the surprise of Black Buffalo Woman. Before she had time to react, Crazy Horse rushed up and kissed her. Any attempt at guessing what he might have said at a time like this would be disrespectful. Yet, how easy it is to imagine that for the first and only time in his life, words poured forth from his lips with the force and clarity of a crystal waterfall. 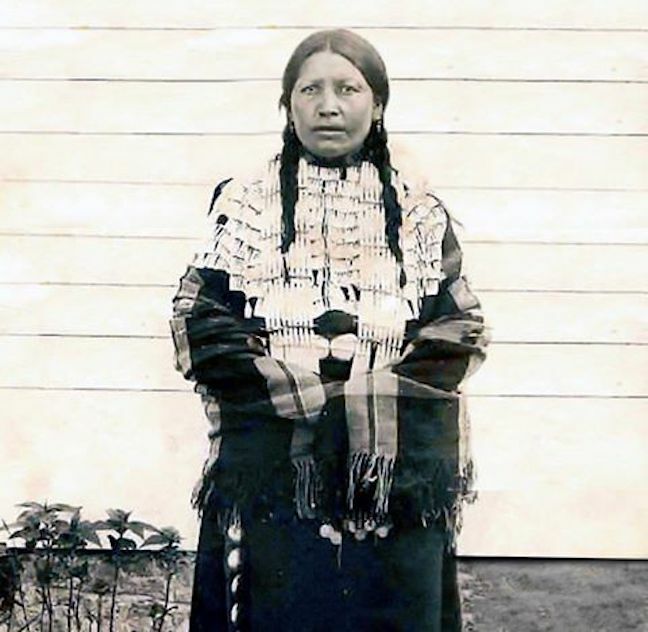 Despite having two small children, a third one on the way, and being married to a jealous alcoholic (or maybe because of it), the desperate, impassioned plea of Crazy Horse melted the lonely heart of Black Buffalo Woman, at least for the moment. Electrified with high-spirited joy, the two of them left Red Cloud's village in full view of everyone. They even brought some of their friends along, including Touch the Clouds. The mood was fun and festive. Her face was painted scarlet. How easy it is to imagine that for the first and only time in his life, Crazy Horse didn't give a flaming spotted buffalo chip about his sparkling reputation. A Lakota woman had a right to leave her husband any time. The social rules regarding it were fairly straightforward: The lodge and everything in it, including the children, belonged to the wife. The husband was simply expected to gather his personal belongings and move on. As you might expect, this worked better in theory than in practice. No-Water learned on his return that his wife had eloped with the Strange One. No-Water's feet stayed a very long time in the spot where he heard the news, his hot face crimsoned with humiliated shame. She left him. Everyone knew. No-Water bowed his head for a long, dark time, then scanned the distant hillsides, pointlessly hoping that the lovers might somehow change heart and return. Seeing nothing but land and sky, he wandered over to a friend's tipi and casually let himself in. “Help yourself!” said the friend, motioning to the inclined wall opposite the lodge’s entrance. No-Water approached the wall where the weapons were kept. From it hung a rawhide shield with an eagle painted on it, a cherry wood bow, a quiverful of metal-tipped arrows, a bowie knife with a 12-inch blade, a 20-year-old hunting rifle, and a sawed-off handgun. No-Water selected the handgun and opened it to see that it was loaded, then clicked it shut and tucked it in his waistband. “Gonna catch you some game?” inquired the friend. “Count on it,” answered No-Water, as he exited his friend's tipi, slamming the flap as he went. If the friend wondered why a man who just lost his wife to another man would hunt game with a handgun instead of a hunting rifle, he never asked. No-Water followed their trail. He soon located the tipi they were sharing so cozily, in a charming little clearing by a creek. Their friends were camped not far away. Inside, the two of them gazed upon each other. Crazy Horse just stared at Black Buffalo Woman, drinking her in, mesmerized by her earthy, feminine fragrance, the smoothness of her skin, the soothing sound of her resonant voice, whatever it was she was talking about. Black Buffalo Woman, delirious with the sensual pleasure of being wanted by an insane and very horny man, was saying all the things she thought such a man might like to hear. No-Water burst in suddenly. Black Buffalo Woman squeezed herself out from under the lodge skins and ran like a branded mare, zigzagging to avoid the imaginary bullets that chased her. Crazy Horse never saw her again. “My friend, I have come!” said No-Water to Crazy Horse, then shot him in the face at point-blank range. Crazy Horse fell backward as the bullet tore through muscle and nerves, shattering the left side of his jaw. His friends chased No Water, but No Water escaped safely back to camp by literally running his horse to death, then continuing home on foot. On regaining consciousness, Crazy Horse let his friends know, most likely via sign language, that the lady was not to blame, and that the lady must not be punished for the foolishness of men. In accordance with his request, Crazy Horse's friends searched for Black Buffalo Woman. They found her cowering in the brush somewhere and took her home to her family. This was her wish, even upon learning that Crazy Horse had survived the attack. The notion of elopement had lost its romantic appeal all of a sudden. Besides, she had children to think about. The Headmen of No-Water's band held an emergency Council meeting, where it was agreed that Black Buffalo Woman should be allowed to return to her husband in peace. She and No-Water both were comfortable enough with this arrangement, though it's a safe guess that relations between them were a bit chilly from then on. Neither of them rejoiced on knowing that Crazy Horse had survived. In fact, they avoided him entirely for the rest of his life. As much as he may have wished otherwise, Crazy Horse would recover from the injury. But nerve and muscle damage left his face permanently disfigured. Other braves had suffered wounds of honor, from the battle or the hunt. Or the sacrificial piercing of the flesh, performed at the Sun Dance so that others might suffer less. Crazy Horse's wound told a much more shameful story. Other braves were wounded on their backs, chests, arms, and legs. Crazy Horse's wound was on his face, never to be shielded from public view. From his nose to his lip ran a nasty gash which evolved into a dark fissure in the approximate shape of a shooting star that curved its way across and down the left side of his face. His mouth turned forever downward, creating a permanently dolorous facial expression that suggested, with tragic irony, someone who is fighting back tears. Tribal officials reminded No-Water and Crazy Horse that they were far too busy fighting for their lives against white armies to waste time fighting each other for a woman. Neither man needed much convincing. Never would Crazy Horse harm one among the people. And No Water, unaware of this fact, had nearly soiled himself in terror on learning that Crazy Horse had survived. Now No-Water was afraid to fall asleep at night. At the urging of the Chiefs, No-Water reluctantly gave Crazy Horse his two best ponies to smooth things over for trying to murder him in cold blood. Crazy Horse was far from satisfied, but there was nothing much he could do about it. Later, somewhere outside of camp, Crazy Horse was riding one of the ponies No-Water had given him, when he spotted No-Water in the distance. In a rare fit of excitement (anger was beneath him), Crazy Horse issued a battle cry, then chased No-Water and his pathetically inferior old nag clear across the Wyoming River before finally letting them get away. So frightened was No-Water by the incident that he packed up his wife and kids and disappeared forever to the Agency. He had no further contact with the “hostile” bands. Crazy Horse mostly avoided the Bad Face camp after that. Now he would divide his time between his mother's Brule village and the Bad Bow Hunkpapas under Sitting Bull. Soon after the shooting, Crazy Horse respectfully asked his friend Red Feather if he might choose Red Feather's sister as a wife. She was a lovely Minneconjou lady named Tasheena Sapa. In English, Black Shawl. Crazy Horse and Sheena Sapa were both pushing thirty. Both were considered far too old to still be living at home. Sheena Sapa adored Crazy Horse for reasons that were obvious to everyone. But unlike the others, Sheena didn't find him strange at all. Red Feather graciously blessed this union, and Sheena became the devoted wife who helped Crazy Horse through his darkest days. For a time, he felt his strength returning, as Sheena nursed his fractured face. For just this once, he allowed himself to rest, and let his comforting new wife massage his weary feet. “Going on an errand – come along?” said Little Hawk. “Next time,” said Crazy Horse, regarding his brother through sleepy eyes. It was the only time Crazy Horse ever declined a reasonable request. He awoke suddenly, not knowing how long he'd been asleep. The face of his wife issued a message of unimaginable horror. “WHO?? ?” shouted Crazy Horse, jumping to his feet. Her dutiful message now conveyed, Sheena Sapa broke down and sobbed. The news of his brother's death crushed him. Crazy Horse knew he could have been at Little Hawk's side – would have surely saved him, or died trying – had he not gotten himself shot for chasing another man's wife. Crazy Horse was overcome with guilt and shame and the deep, burdensome sorrow of irretrievable loss. As an added insult, Crazy Horse was soon stripped of the title of Shirt-Wearer for failing to behave in the exemplary manner expected of him. Not that he cared. All he could probably think about was Hump. And Little Hawk. And the extinction of his tribe. Of all tribes. Everything was falling apart. It was around that time when Crazy Horse consulted with a medicine man named Chips, who happened to be a member of No-Water's band. Supposedly, Chips gave Crazy Horse a bullet-proofing “medicine.” Supposedly, no bullet ever hit him again after that. But history conveniently glosses over the fact that no bullets ever hit him before that either. That is, until No-Water shot him. His apparent immunity from bullets is authentic and well documented, both before and after his visit with Chips. Chips had little to do with the battlefield accomplishments of Crazy Horse. The dried Eagle heart and the spotted tail feather given to him by Chips were only two of the key ingredients in Crazy Horse's powerful medicine bundle. Another crucial element was a lucky accident of birth - a purely instinctive, unimaginably precise understanding of things in motion. With this, he could evaluate the range of enemy forces better than anyone else could, keenly predicting where artillery would land. This skill apparently worked both ways, as evidenced by his impeccable aim. The flat, polished stones he wore – one behind his left ear, the other guarding his heart - were bulletproof too, just in case. The final ingredient, a true measure of the man, was the awe-inspiring bravery it took to remain at all times in the line of fire, mere inches out of artillery range. Crazy Horse never left the Daring Line, compelling his attackers to keep shooting and wondering, incredulous, why they could never hit him. Try as they might, bullet after wasted bullet popped harmless little dust clouds on the green around his galloping horse's feet. As for the other decoys, those who hung further back coaxed fewer bullets from the soldier guns. Those who ventured any nearer lay dead in the dirt like swatted flies. No longer did Crazy Horse paint himself as the rider of his dream. The only paint he sometimes wore was a simple red lightning streak that zigzagged from his forehead to the left side of his nose, then down to the point of his chin, as seen on the face of the rider of his dream, and occasionally on the face of Sitting Bull. But even this he may have done only to cover the shameful scar. That same year, Red Cloud made another trip to Washington DC and met with President Ulysses Grant. The Red Cloud Agency was established on the Platte River as a result of Red Cloud's political dealings with U.S. Government officials, or so it seemed. The U.S. Army ordered the abandonment of Fort Kearny Nebraska, supposedly as a result of Red Cloud's influence. Soon after, a survey conducted by the Northern Pacific Railway planned a route across the northern plains. The route ran directly through lands occupied by the Hunkpapa bands. Crazy Horse and Sitting Bull led the resistance against the railroad. They and their men conducted train raids that deterred would-be travelers and secured badly needed supplies for countless cold and hungry Lakota families. By this time, many among the people looked at Crazy Horse and wanted what he had - complete self-sufficiency. The people wished not to become prisoners of war at the Agency. They wanted just to be left alone to hunt and live their lives, and they saw no reason why they could not do that. Indeed, there was (and still is) enough land for everyone. The people had lived in this way for so many thousand years. Many simply could not imagine the white invasion as anything more than a temporary affliction. This, too, would pass, it seemed. The Old World Order would one day be restored. Crazy Horse and Sitting Bull devoted themselves to this worthy cause, but the people were already a fractured Nation. The bison had been slaughtered to near extinction, as the U.S. government utilized starvation tactics to force Indians to surrender. Too many had already moved to the Agencies, with more and more arriving every day. Before long, not enough warriors remained to make a fight. 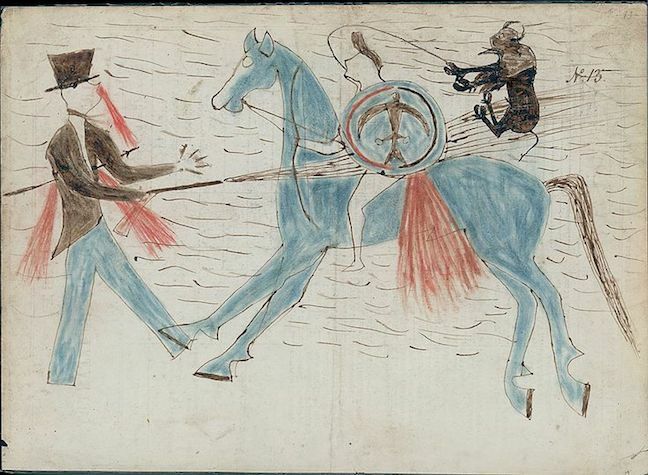 Above image: A work of ledger art in which Sitting Bull spears a white man, whose bullets ineptly miss Sitting Bull. Tashunka Witko and Tatanka Iyotake had so much in common that people still confuse one with the other. Both were great Hunkpapa leaders of the Tiatumwa (“Teton”) Nation. Both were infused with the giving spirit. Both were brave beyond measure. Both were peaceful by nature, yet either could quickly and easily kill any attacker. Both were analytical thinkers. Tragically, both men would meet their ends in the same awful way, at the hands of people who had requested their leadership for a cause already lost. Yet, as long as any followers remained in the field, Sitting Bull and Crazy Horse would lead them. For smaller plains tribes like the Absaroka, Shoshone, and Assiniboine, surrendering to the whites had been easier, whipped as they already were by larger tribes like the Oglala, Arapahoe, and Northern Cheyenne. Understandably, the smaller tribes were eager to ally with U.S. troops and work as Indian scouts. These jobs would keep their families clothed and fed. Crazy Horse sometimes stopped at the agencies to trade fresh meat for guns and ammunition. As he did, he often passed by the Loafers. “Why don't you just come in?” they said, with condescending smiles. Crazy Horse knew not what they meant. Agency conditions were deplorable. Children were dying like seedlings in a drought. The Loafers might as well have asked him why he didn't just lock is people in cages and starve them to death. At this, they must have rolled their eyes skyward. They knew which way the arrows pointed. The whites were too many, the bison too few. The old ways were ancient history now. He might as well have clattered up to them in a suit of shining armor, slicing the air with a lance, professing his royal Knighthood, and scanning the distance for fire-breathing dragons.